Asheville is known for its preponderance of local breweries, but if all goes according to plan the city will soon become DeWine country. It was announced Tuesday that the South Atlantic League's Asheville Tourists are being purchased by DeWine Seeds Silver Dollar Baseball LLC, a family ownership group whose patriarch is former United States Senator Mike DeWine. The Class A Colorado Rockies affiliate is currently owned by Palace Sports and Entertainment, a Detroit-based group that also owns the NBA's Pistons franchise. 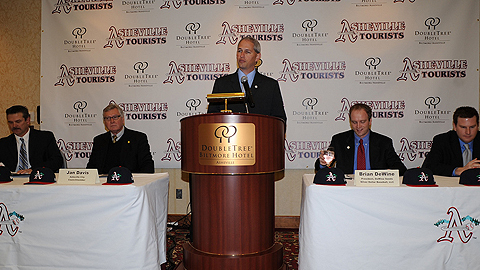 The deal is not expected to become official until March, as Major League Baseball, Minor League Baseball, the South Atlantic League and the city of Asheville still need to approve the deal (the latter entity's involvement is necessary because the Tourists' McCormick Field is a city-owned ballpark). Upon approval of the sale, 30-year-old Brian DeWine will take over as club president. The fifth of eight DeWine children, Brian has most recently served as Ticket Manager for the University of Chattanooga Athletic Department. Prior to that, he accumulated extensive Minor League Baseball experience through a four-year stint with the Southern League's Carolina Mudcats. "Owning a team is something [the family] has talked about for a while, and over the past year we decided 'Let's do this'" explained DeWine, whose wife, Kali, is expecting the couple's first child. "So we started working our connections, in terms of who knew who, and who may listen to an offer. From a personal standpoint, this is the right fit. We're going to raise our family here, and wanted a city with a strong baseball tradition, where the sport is an integral part of the community." Given that the sale isn't expected to be approved until March, DeWine is looking at 2010 as a transitional season. "We're going to use 2010 as a year in which to evaluate the operation, while sticking with the plan of the current ownership group," he said. "At this point it's not about saying what we're definitely going to do or not do, the goal is to continue to provide a great game atmosphere and great customer service. ... I'll be very involved in 2010, and in attendance at every game, but we're looking at 2011 as the first true season [under DeWine family ownership]." And DeWine's involvement figures to be very hands-on. "I've spent plenty of time in the Minor Leagues pulling tarp and dressing up in the mascot suit, and I'm going to continue to do those sort of things," he said. "I don't have an ivory tower perspective." But as for the rest of the family, Dewine says that their day-to-day responsibilities will be far less grueling. "The only thing they have to do is come down to the games and eat some hot dogs."